Twenty years ago this week, the first mobile text message, or SMS, was sent by British engineer Neil Papworth. Today, Americans are texting more than ever and among young adults, many of whom were not yet born when the first message was sent, texting is almost as common a mobile activity as talking. And why wouldn’t it be? According to the latest Simmons National Consumer Study, 48% of adults ages 18-to-24 say that a conversation via text message is just as meaningful as a telephone call. A similar share of adults ages 25-to-34 feel the same way. Regardless of age, texting is still, technically, the second most common activity that Americans engage in on their cell phone after talking. During a typical week, 95% of mobile adults talk on their mobile phone, while 59% text. Among adults ages 18-to-24, however, 89% talk on their phone and 85% text. Despite the increasing availability of mobile chat or instant message applications, texting remains the dominant means for exchanging short messages. Only 8% of all mobile adults use their phone to IM or chat. To get a more in-depth understanding of the texting habits of adults today, we leveraged data from the Simmons Connect mobile panel of 1,485 U.S. smartphone owners. Hands down, young adults text more than any age other age group. During a typical month, in fact, smartphone-owners ages 18-to-24 send 2,022 mobile text messages and receive another 1,831 for a combined total of 3,852 texts sent and received. 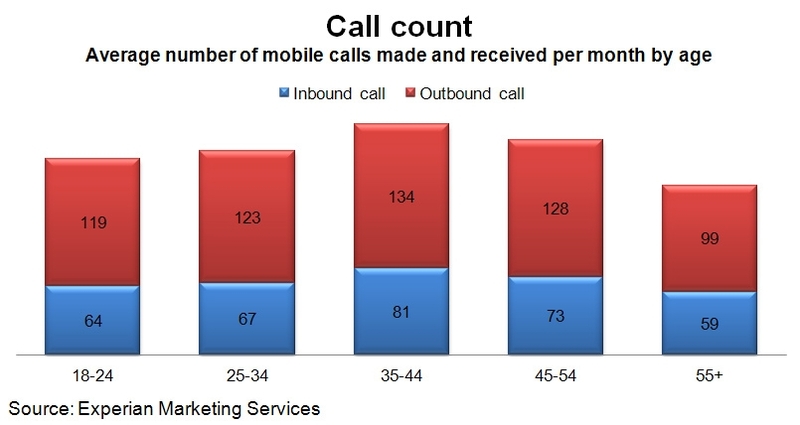 With every age bracket we move up, the number of mobile texts drops by roughly 40%. For instance, smartphone owners ages 25-to-34 send, on average, 1,110 text messages a month and receive another 1,130 for a combined total of 2,240 messages. Unlike television and radio, which have peak hours for reaching consumers, mobile text messages reach Americans throughout the day, providing advertisers with a medium to connect with consumers any time they want or need. 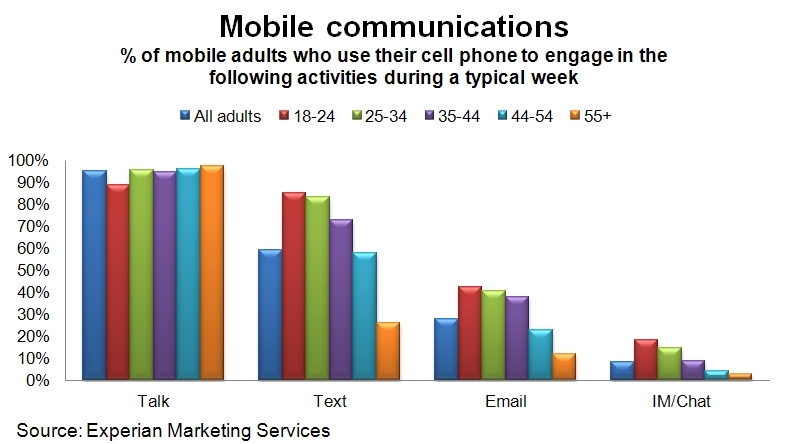 No surprise, young adults are the most likely to send and receive mobile text messages throughout the day. The smartphone panel data shows that during every hour between 8:00 A.M. and midnight, more than half of young smartphone owners are both sending and receiving mobile text messages. 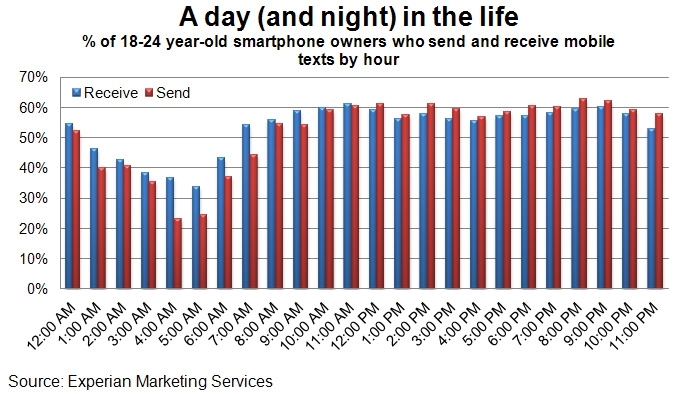 Even when most of us are asleep, young adults’ smartphones continue buzzing from inbound texts. In fact, 37% of 18-to-24 year-old smartphone owners receive texts at 4:00 in the morning. By comparison, just 20% of smartphone-owners ages 25-to-34 years-old receive texts at this late (or early) hour as do 17% of those 35-to-44, 15% of those 45-to-54 and 10% of those ages 55 and older. Better to send or to receive? During overnight hours, the share of young smartphone owners who send texts surpasses the share who receives them. However, by 8:00 A.M., the difference between those two figures narrows to the point that they are nearly equal. In fact, from noon until 11:00 P.M., young adults are more likely to send mobile text messages than they are to receive them. While texting is still a secondary use of mobile phones after calling, that’s not the case all day, especially among young adults. In fact, while smartphone owners ages 18-to-24 are more likely to make an outbound call than they are to send a text from their phone between 7:00 A.M. and 10:00 P.M., they are more likely to send a text between 11:00 P.M. and 6:00 A.M., during hours when they might understandably wake the recipient. That should help us all sleep a little better.